Of all the retro-themed, vintage-inspired watches that have been launched to date, the Tudor Heritage Black Bay (or BB, as it's more commonly referred to in horro circles), has to be the most highly sought after. Since it's first appearance at Basel last year, almost everyone who has seen it on the web, has been eagerly anticipating it's launch, collectors and almost every other Joe on the street. When it first arrived on our shores, the initial batch were snapped up before your can even say "Tudor Heritage Black Bay". It didn't help that most were already pre-allocated to valued customers of the AD's that managed to get stock of this much coveted model. So popular was it that retailers did not offer any discounts, at least not to the average Joe like me. I've pretty much given up all hope of owning one when on the Eve of the recent New Year's eve, a mate informed me that one of our regular AD has just received a shipment of the BB. I was on the phone with the my regular sales guy within seconds of this tip off. He even offered me a slight discount, too. And 2 hours later, the watch was on my wrist. Oh! And the icing on the cake? The missus came along and decided to foot the bill as the present for my coming birthday, which was 2 weeks away. A sweet end to the year indeed! Now I've spent some time with this much-desired piece of art, it's time for a little walk through. This piece is based on the very successful Tudor Sub of days gone. There are several design coups that make this watch visually stunning. The First thing that is visually captivating about this watch is the burgundy coloured bezel. This particular hue is very retro in itself. It brings back memories of the laid back 60's and glorious 70's. A very apt colour for a vintage-themed watch. 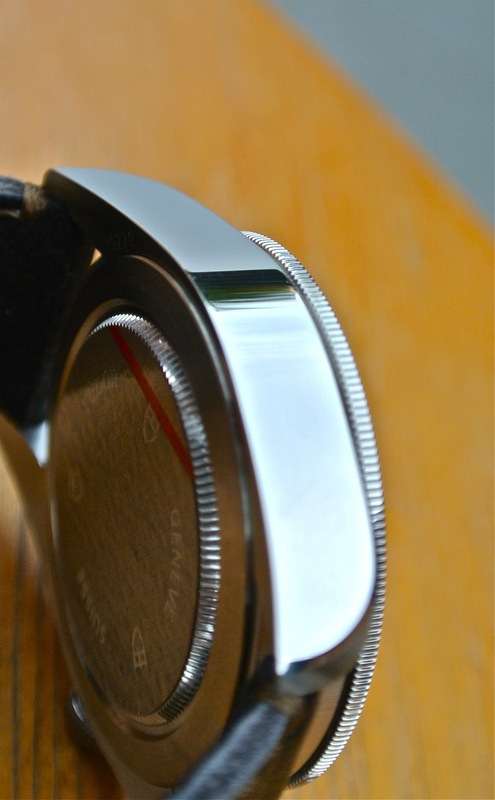 However, the eye-catching bezel is not all form and zero function. It requires 60 precise clicks to complete a full rotation. Each turn is registered and confirmed by a loud, crisp click. there is absolutely no free play. Complementing the bezel perfectly, is the matt dial with gilt round indices and dark golden minute markers. The next design coup is the signature (gilt) snowflake hands. This further adds to the vintage theme. I am particularly pleased with the crown design. Unlike most watches, it does not sit onto the case directly. It sits on the stem housing (dressed i the same burgundy hue), thus leaving a gap between the crown and the case, making it easy for short-nailed folks like me to operate the crown. The stainless steel case is beautifully finished with brushed and highly polished surfaces, while the large crown is signed with the Tudor Rose. Being a relatively small case (41mm) the lugs are set pretty low. This is the perfect position for this watch as it allows the straps to drape over the wrist for a comfortable fit. The case back is finished in the same spartan, utilitarian fashion, common with Tudor (which is a tad less spartan than Rolex, IMHO). 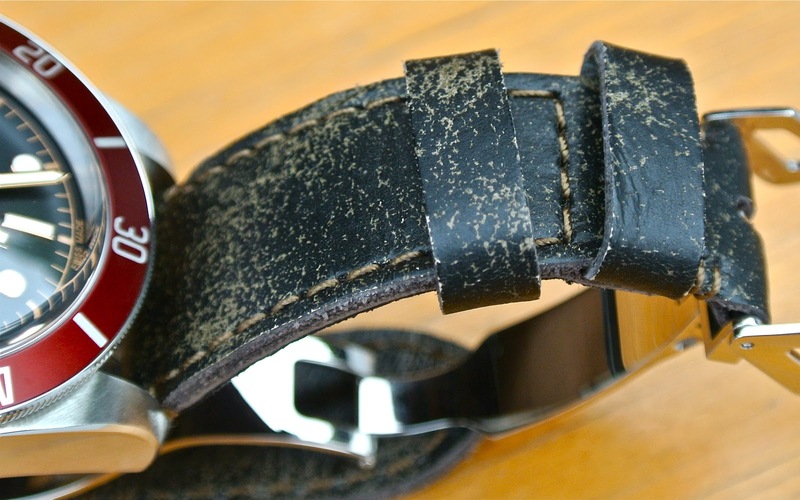 The final aspect of the design coup, imho is the distressed leather strap the design team has picked. this further adds to the vintage theme of this modern day classic. Oh, I forgot to mention another feature I like about this watch - the domed sapphire crystal. 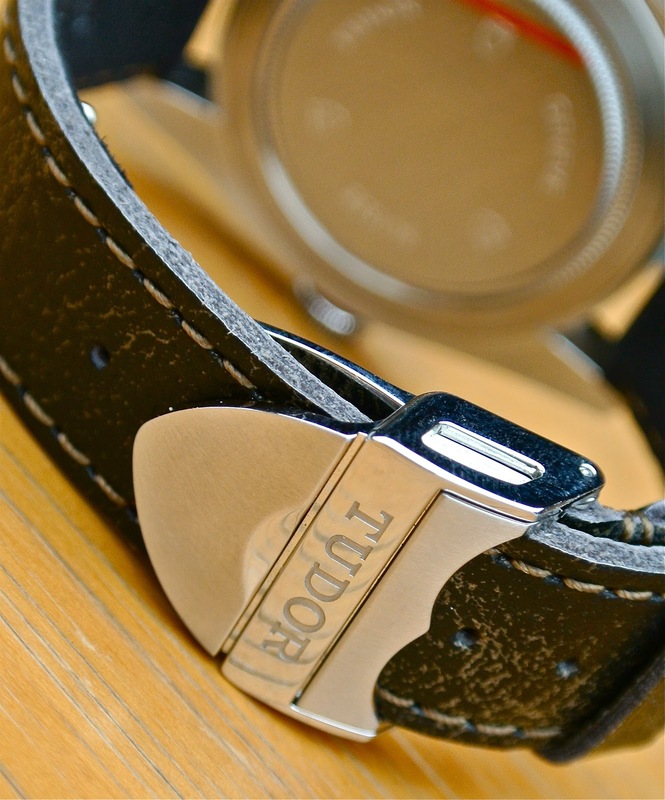 The straps are fitted to a brushed and polished stainless steel folding clasp. It is signed on the main clasp as well as the secondary locking catch. And in case you have not noticed it yet, when locked in place, it transforms into the second Tudor emblem - the Tudor Shield. A clever and well thought out design. The BB looks as good in the dark as it does in the glorious light of day. The lume is so bright it looks like it's electrically charged! This beautifully crafted masterpiece sits very comfortablly on my 6.75' wrist. There isn't any overhang despite the relatively straight lugs. this is due to it's rather modest 41mm case diameter. This watch comes with an additional fabric strap. But I'd much prefer another pair of distressed leather. It's also available in stainless steel bracelet. I personally feel that the leather version beats the bracelet variant hands down in the looks department. The bracelet makes the watch far too stiff. It's like hiding a beauty like Jessica Alba under a Hijab. I'd go for the leather option anytime. I'm not an expert in the world of horology, and neither am I any authoritative figure in that elite group, but my gut feel tells me that ti is going to be Tudor's biggest commercial success to date. It's simplicity exudes an understated beauty that doesn't bore nor wear out with time. It possesses a certain elegance that's enveloped in a quite ruggedness. IIn a nutshell, it's a must have! And I'm glad I've got one! Power reserve: +/- 36-38 hours. - Case design and finishing - top notch. - Still rather limited stock. - Might not be cheap to most people (for a 2824 movement). - Identical after-market distressed leather hard to come by. - Possibly high cost of strap replacement. - Relatively low power reserve. I just got mine; an awesome watch and I doubt I will ever get bored of it. Excellent review too - it was one of a few reviews that convinced me to get this watch. No worries. Glad to be of service. I always thought the bracelet version would be nicer, but I managed to get my hands on the strap version and I must say, the bracelet pales in comparison to that lovely distressed leather strap! Indeed. Fitted with the distssed straps, this watch really stands out among the crowd. Gives it a very retro-classic look. The bracelet version doesn't do it as much justice. No offense to those who has or prefer thenbracelet variant. This is purely my personal opinion. Just curious how your timekeeping has been? I'm not going to rag on the 2824. Many will disagree, but I feel despite it's mass production that in top grade form it is very nearly the equal of Rolex's coveted 3135 in timekeeping and reliability. Time keeping is alright by my standards. BTW, I don't measure the timing at all. not to the second. i'm not late for any appointments still haha. but the power reserve is really short, though. I just purchased the Heritage Black Bay for my birthday. It is a beautiful watch. I understand that the ETA 2824 movement comes in 4 grades. See: http://en.wikipedia.org/wiki/ETA_SA#ETA_2824-2. 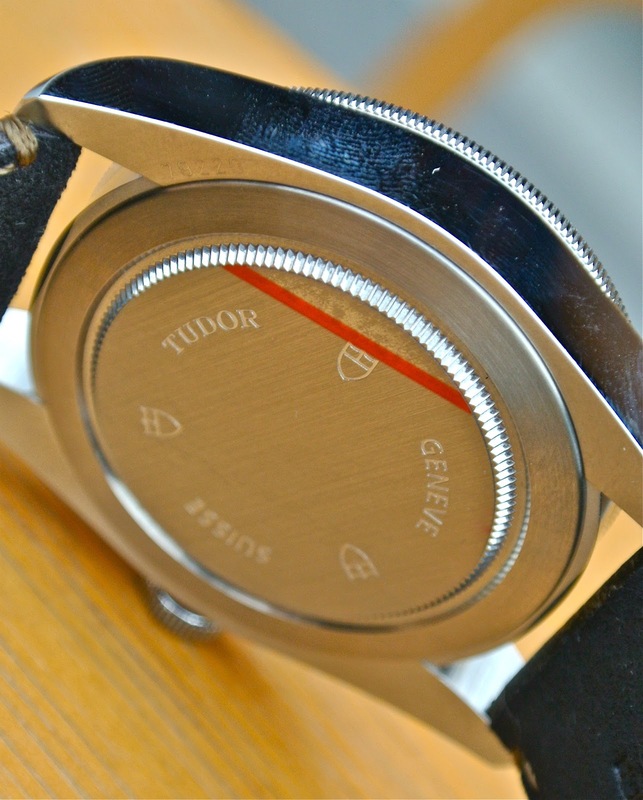 Does anyone know what grade Tudor uses in its watches. I'm sure it is not the Chronometer grade since there is no mention of such on their website or in the paperwork that came with my watch. Is it a modified "Top" grade? Thank you. According to WatchTime, the ETA 2824 movement is a modified "Top" grade - one notch below certified chronometer.